MacPherson Walk is the newest lifestyle community merging urban living amongst 3.5 acres of natural and serene landscaping. West Coast inspired archictecture by Robert Ciccozzi and finishes with some of the freshest interior design choices from BYU Design, make this development a favorite for those wanting both contemporary and traditional in their home. Inviting details such as drop off circles for vehicles, garden areas, fireside lounge, guest suites, large barbeque patios and expansive modern lobby areas make it a home that will impress your visitors with a warm welcome. The low-rise development, with some townhouse units, consists of two addresses, 5883 Irmin Street (East) and 5665 Irmin Street (West), totalling 345 units. Your community includes elementary, high school, MacPherson pool, Michael J. Fox theatre, restaurants, retail/services and several parks, all within walking distance. 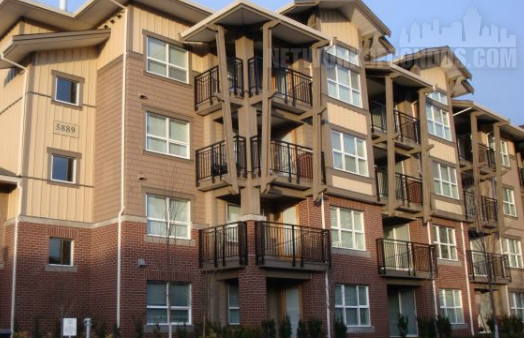 Close to Royal Oak SkyTrain station and only a few minutes drive to Metrotown Centre. This is an established community that is enjoying the new entry of vibrant communities of young familes and the like. Comprehensive building and envelope protection, rainscreened and double glazed Energy Star windows. 2-5-10 Warranty by Travelers Guarantee for piece of mind.